Professional baseball player and a successful racer CJ Wilson became the official face of the well-known watch company Graham. The fact that Graham company for many years evinces a special interest in the world of motor racing and supports the development on an unprecedented high level, makes a young athlete, who has the seventh consecutive year takes pride of place in the premier league, to begin cooperation with the brand. "For me, it is important that the company Graham is interested in motorsport. First of all, I appreciate the fact that the brand is serious about not only the design of its products, but also their technical execution. " CJ Wilson is a successful athlete is not only on the baseball field, but also on the race track, whose last victory was the victory in the race SCCA Pro Racing MX-5 Cup in September last year. The well-known athlete, who is the owner of CJ Wilson Racing, is also involved in charity work, providing funds for the treatment of children with chronic and incurable diseases. Showing his love and respect for the company, CJ Wilson has chosen as a companion the Chronofigher Oversize Diver watch, in which he praised the perfect balance between technical possibilities and the watch style. 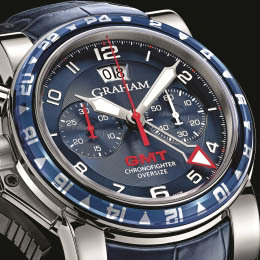 As he noted, "in Graham watches a spirit of manhood, and every design element - individual and unique." The Chronofighter Oversize Diver (Ref. 2OVEB.B40A) watch - the best friend of the racer and baseball player - the owner of a steel case with black PVD-coated in 47 mm diameter, on the left side of which are buttons for start / stop and reset, decorated with a Clous de Paris pattern. The watch is designed on the basis of the manufacturing automatic movement G1734 with chronograph function. The unique caliber on the 27 jewels with a carrying frequency of 28,800 vibrations per hour and 48-hour power reserve has a shockproof system Incabloc. The mechanism provides a display function of hours, minutes, seconds, chronograph, and date. The helium valve is mounted on the case at the 7 o’clock position. The steel bezel with black PVD-coated is equipped with a rotating ring to measure the time of decompression. The front side of the case is protected by an anti-reflective sapphire crystal. On the steel back side with black PVD-plated is inlaid with the Royal Marine symbol. Time is indexed on the black dial with black nickel hands coated with black luminescent material Super-LumiNova. The black chronograph second hand and the minute hand of the indicator on the end are colored orange, which allows for easy reading under all lighting conditions. The watch water-resistant is 300 meters. A stylish sporty appearance of the watch is completed by an integrated into the case a black rubber strap with a buckle.